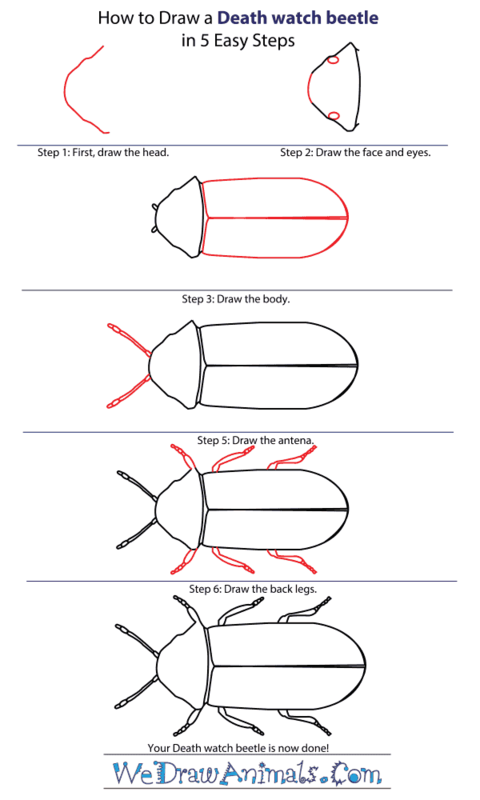 In this quick tutorial you'll learn how to draw a Death Watch Beetle in 5 easy steps - great for kids and novice artists. At the bottom you can read some interesting facts about the Death Watch Beetle. 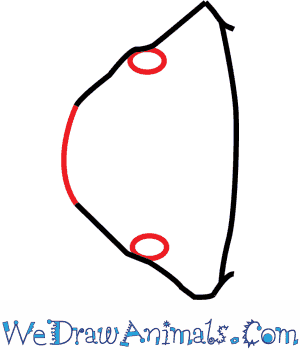 Step 1: Start your beetle by making a lumpy, curved line for a head. 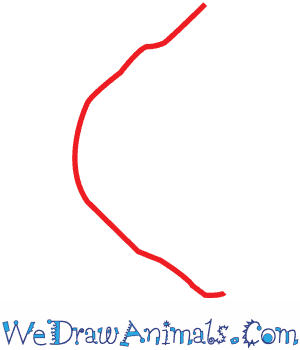 Step 2: Draw a straight line across the bottom to make the face. It looks a bit like a sideways space ship. 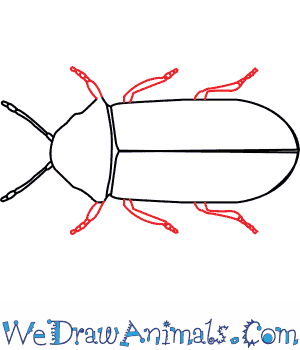 Add eyes to either end in the middle of your beetle's head. It uses its head or jaws to tap or click on wood as it bores through it to attract other deathwatch beetles. 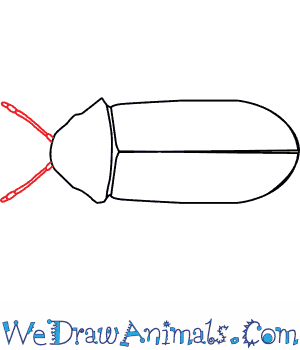 Step 3: The beetle's body is tongue shaped. Draw a line splitting it through the middle to mark the wings. 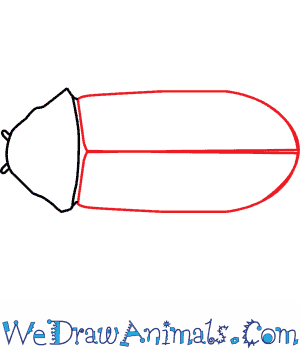 Step 4: Next, draw the antennae. They are straight, narrow, stick-like lines, with segment line detail. Step 5: Lastly, draw the legs. They are very similar to the antennae in the way you draw them. Bend the back four legs slightly, and add segment details to all six. That's it, you've completed your deathwatch beetle! 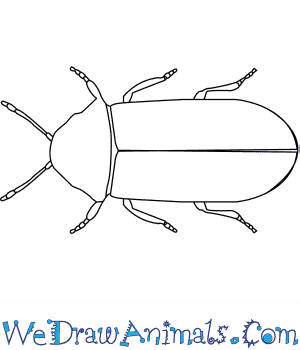 If you want to color it in, these beetles are a blackish brown with dark brown spots. The Deathwatch Beetle is a member of the insect family and the scientific term for them is Xestobium rufovillosum. They get their name by keeping people awake as they make tapping noises in buildings on summer evenings that can be heard by humans. Traditionally, people have stayed up all night with people expecting to die soon. These people were designated as the Deathwatcher. This animal is associated with omens of doom. The adult reaches a size of about .28 inches long. This species has been written about by famous poets. The baby reaches a size of about .43 inches long. This insect has been featured in a movie. A music band wrote about this species in 1975. There is a television series depicting this animal. There is a novel which mentions this species. This insect has inspired the name of a song that is over 17 minutes in length. The character Sherlock Holmes used this particular beetle as an example of death. These tiny animals make holes in wood as it eats through wall structures that are weakened by fungal decay. The insect has a grainy brown and black wood-like coloration.